Frogs are amphibians in the order Anura. There are more than 5000 described species of frog in the world, divided into 33 different families, and about 88% of known amphibian species are frogs. Anura is one of the most diverse order of vertebrates. The biggest frog family Leptodactylidae (about 1100 species), Hylidae (about 800 species) and Ranidae (about 750 species). Frogs are found all over the world, from the tropics to the sub-arctic regions. They, however, not found in the desert right. The majority of species live in tropical rainforests. Frogs usually spawn in a body of water such as lakes, ponds and water stagnation. The eggs develop into larvae (commonly referred to as tadpoles) in the water. Tadpoles are equipped with gills and breathe like fish, frogs, while adults absorb oxygen from the air such as mammals. How the water of life will be very different from adult frogs of various species. Some spend much time in the water and rarely attempt to land, while others prefer to stay out of the water until the time for mating. Adult frogs are carnivorous. Unlike the other terrestrial vertebrates, frog skin adults have very permeabel where oxygen can be absorbed. Oxygen is' cut off the water film on the skin before reaching the bloodstream. This is why it is so important for a toad would never let her skin dry. Other problems with the skin has a very permeabel is that so many toxins from the environment will go through it. This makes the frogs are sensitive to pollution. Frogs are widely classified into three different subordo: Archaeobatrachia, Mesobatrachia and Neobatrachia. Archaeobatrachia only contains four families and they are all primitive frogs. There are 28 types specified in this subordo and they all have certain physiological characteristics that can not be seen in other members of the public order Anura. Archaeobatrachia tend to be quite small and mainly live in Eurasia and New Zeeland. The Mesobatrachia subordo created in 1993 and currently contains 168 species divided into six families and 20 genera. Said meso means middle and not as old as Mesobatrachia species found in Archaeobatrachia (Archeo means ancient), but not as young as species in Neobatrachia (neo means new). Subordo Neobatrachia is large in comparison with the other two. It contains 24 families and more than 5000 species. More than 96 percent of all described species of frogs belonging to this subordo. Neobatrachia generally divided into four superfamilies - Bufonoidea, Hyloidea, Microhyloidea and Ranoidea - but the classification is controversial and different members have different opinions about which species should be included in the respective superfamily. 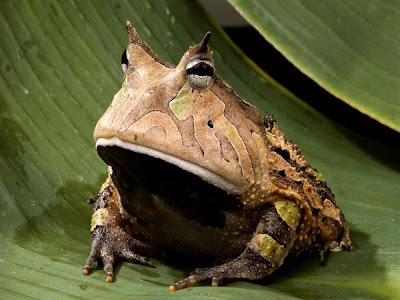 In everyday speech, the distinction often made between frogs and toads by their appearance, but has no taxonomic justification. From the perspective of taxonomy, the entire row Anura are frogs, currently only member of the family Bufonidae toads true. But you can find many species of other families who have said in terms of toads in general, and also only a few species in the so-called family Bufonidae frog. In everyday language, the difference between toads and frogs are usually based on appearance. Display the "toad" has changed because they have adapted to a dry environment. "Frog" because it usually comes with dry and warty skin, while frogs have smooth skin and / or humid. But there are exceptions, such as water Bombina bombina fire bellied toad called in English. This species lives in water but has a somewhat warty skin.